Females, harsh quack. Males generally silent. Description: Identified most rapidly by large shovel-shaped bill. Green head, white breast, and brown sides. 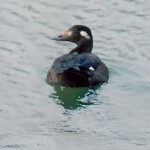 White patch before a black tail. Females mottled brown. In flight show a patch of blue on the forewing, and have a green speculum. Behavior: Uses broad bill to sieve animal matter from the water. 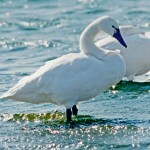 Habitat: Breeding birds occupy shallow prairie marshes and ponds. Prefer habitats rich in zooplankton and phytoplankton. Also prefer non-wooded shorelines and ponds with mud bottoms. 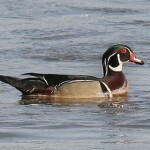 Where in Nebraska: Common, locally abundant, spring migrant statwide. Locally common regular breeder in North Central Nebraska. A rare regular winter visitor in the Platte Valley. 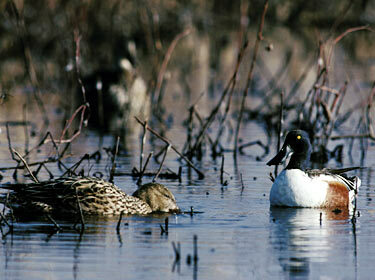 Nebraska Seasons: Usually spring migration numbers peak in late March through late April. Fun Facts: Northern Shoveler females, when flushed off her nest, defecates on the eggs before leaving, possibly to deter predators.